A team of researchers from the CSIC-INTA Astrobiology Centre in Madrid has confirmed that the type of mineralogical composition on the surface of Mars influences the measuring of its temperature. 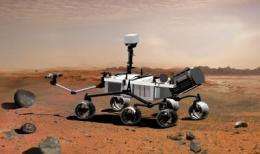 The study is published this week in the Journal of Environmental Monitoring and will be used to interpret the data from the soil temperature sensor of NASA's Mars Science Laboratory (MSL) vehicle, whose launch is envisaged for 2011. María Paz Martín is a researcher at the Astrobiology Centre (the CAB, a CSIC-INTA mixed organisation) and the main author of a study which has just been published by the Journal of Environmental Monitoring. "We have confirmed, by means of infrared spectroscopy tests, that the chemical-mineralogical associations on the surface of Mars influence the measuring of the temperature of the Martian soil", she explained to SINC. The infrared spectrometers register how the different mixtures of minerals reflect this type of radiation and this information is used to calculate the environmental temperature. "This research shows that, in order to carry out the thermal measurements on the surface of Mars, we must bear in mind certain specific mineralogical mixtures", Martín indicated. The results confirm that there exist significant increases and falls of up to 100% in the percentages of the reflectance values (the capacity of reflection of a surface) in mixtures such as those of basalt with hematite in comparison with those of basalt with magnetite. To carry out the study, the scientists have selected and prepared samples of terrestrial minerals which are known to exist on Mars, such as oxides, oxi-hydroxides, sulphates, chlorides, opal and others which come from clay. These compounds were obtained from reference materials from the United States Geological Survey, as well as from different areas of the Earth similar to those of the red planet, like El Jaroso (Almería), the Tinto River (Huelva) and Atacama Desert (Chile). "The experiments confirm that any chemical-mineralogical analytical development on Mars requires the prior satisfactory quality of the methodological tests and routines on Earth", Martin stressed. Jesús Martínez Frías is the co-author of the study and an astrogeologist at the CAB. "The results of this work will also have implications on the detection and exploration of the environments of Mars in which there was liquid water, as well as habitability studies and searches for life", he remarked. The infrared reflectance spectra experimentally obtained may serve as indicators to help in the task. Martínez Frías indicated that this multidisciplinary research, in which geologists, chemists and engineers have collaborated, "opens up a new line of work which will grow with the incorporation of new minerals such as carbonates and analytical routines which bring the spectroscopic analyses closer to the most reliable Martian conditions". More information: Martín Redondo, M.P., Sebastian Martínez, E., Fernández Sampedro, M.T. Armiens, C., Gómez-Elvira, J. and Martinez-Frias, J. "FTIR reflectance of selected minerals and their mixtures: implications for the ground temperature-sensor monitoring on Mars surface environment (NASA/MSL-Rover Environmental Monitoring Station)". Journal of Environmental Monitoring 11: 1428-1432, julio de 2009.